I’m my own superhero this week – gleefully removing obstacles that prevent me from going outside to play. How did I do that you may ask? I bought a mat and a new pair of sneakers. I know, it doesn’t sound heroic at all, blah de blah, Christine bought things, but I had to do a ridiculous amount of thinking to figure that those were the things I needed. I’m sure I have told you before how my ADD makes it hard to break a problem into pieces, I usually refer to it as a reverse ‘forest for the trees’ problem – it’s not that I can’t see the forest for the trees, it’s that I can’t see that the forest is made of trees. So, when I meet some resistance to things I am trying to do, I often can’t see what the solvable issue is – I just see the whole situation as difficult. 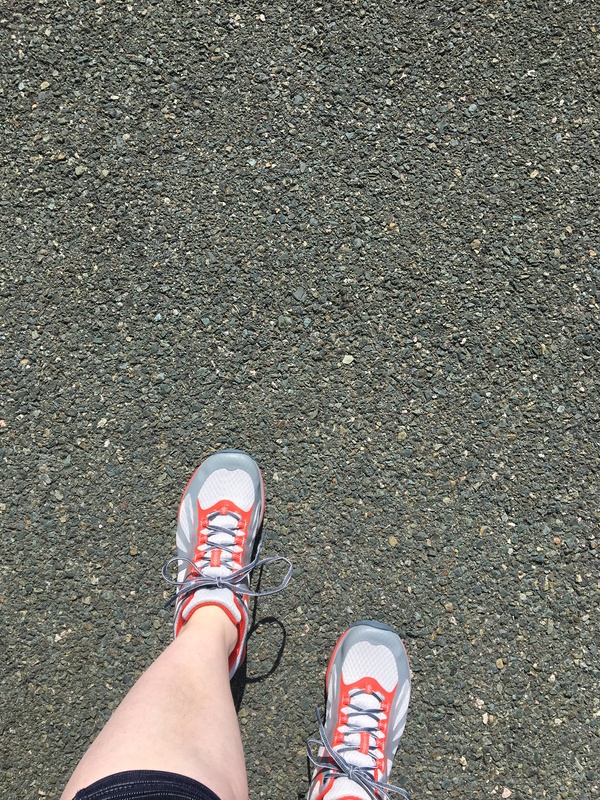 So, given that it is (finally) getting summer(ish) here in Newfoundland*, I want to do more things outdoors, especially exercise. I love to go for walks and I love to do yoga in the sunshine in my yard. But, last summer and fall, I found myself a bit reluctant to go out walking. I liked the process of being on a walk but it was hard to get myself to put on my sneakers. And, also last summer, I really liked the times that I did yoga in the yard but I didn’t do it as often as I meant to. I know that some of the more fitness-driven readers might be thinking – oh, just do it and stop whining about it. You’re right, of course, that’s a lot of the issue. I ‘just’ need to get over myself but there was more to it, and this week,for some reason, I managed to zero in on the issues with both activities. 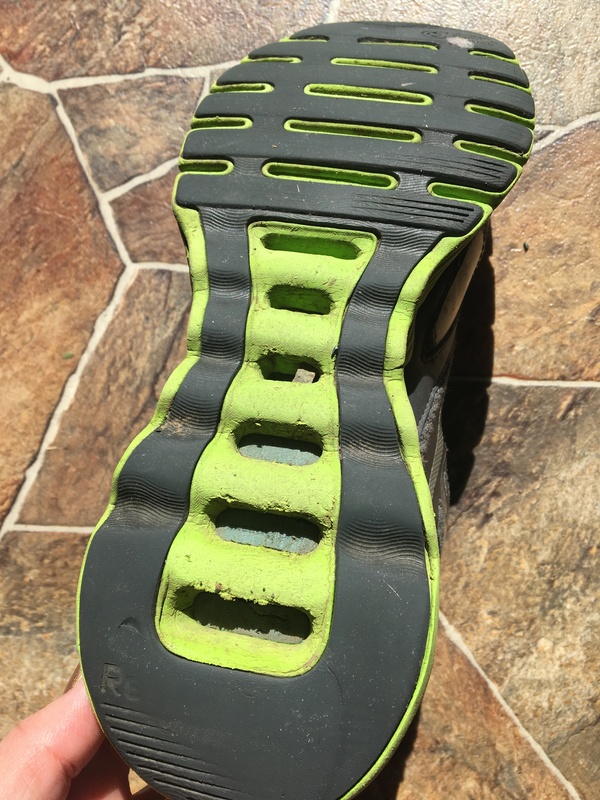 My old sneakers had holes in the sole. I don’t mean that I had worn a hole in them, I mean that the design was such that there were a series of spaces in the sole of the shoe. That may not seem like a big deal until you realize that the holes are big enough to pick up rocks. So, every time I wear them, I have to stop and pry rocks out over and over. It’s annoying but apparently the task had sunk at least part way into my subconscious, so I didn’t really realize what a hassle it had become. See what I mean? Imagine the rocks that could fit in there and click while you walk. It was only this week, when I was putting the sneakers on to walk my son to school for an exam and I suggested a less rocky route, that I realized they were such an impediment. And the sneakers are several years old so I don’t even feel guilty about replacing a pair of ‘perfectly good sneakers’ because they aren’t perfectly good in other ways either. So, now I have a pair of brand new sneakers and I have already taken the long way to get several places just to get a bit more of a walk in. The grass in my backyard is bumpy. I’m sure that there are plenty of rocks getting in my way under the surface out there, as well. Perhaps the sod is not laid well, I don’t know, and I am not about to do the kind of landscaping that would fix it. If I put my yoga mat directly on the grass, I am all uneven, I’m on a slant, and I can’t do any poses requiring balance. 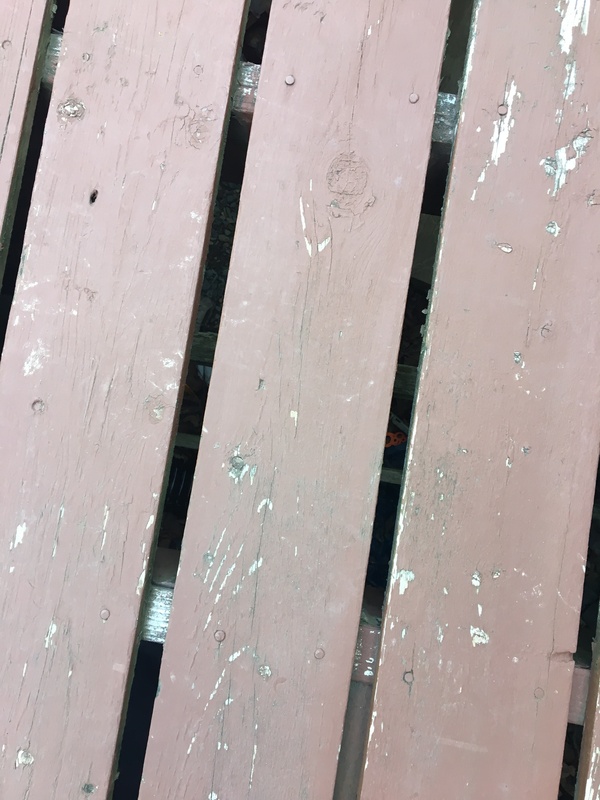 My back deck is old and the ‘floor’ is made of fairly widely spaced slats. If I put my yoga mat directly on that, I can feel the spaces under my feet or back or knee, and one of my fingers always ends up pushing my yoga mat into the space. Look at those finger-trapping spaces. Ignore how badly the deck needs painting, we’ve only had about nice days so far, so painting will have to wait. Last summer, I countered the problem by dragging a piece of plywood from behind the shed and placing it on the grass before putting my yoga mat down. It worked but it added one more task to the process of doing yoga and that was enough hassle to stop me sometimes. After I bought my sneakers on Wednesday, my next errand was the grocery store. Since I was in problem solving mode, I guess my brain decided it was a good time to kick up the memory of the patio mats I had seen at that store a couple of weeks before. Previous to that, I didn’t know patio mats existed. This time, I put two and two together and, to quote my dad, ‘got something approximating four’ and realized that the patio mat would instantly remove the obstacle to putting my yoga mat on the deck. 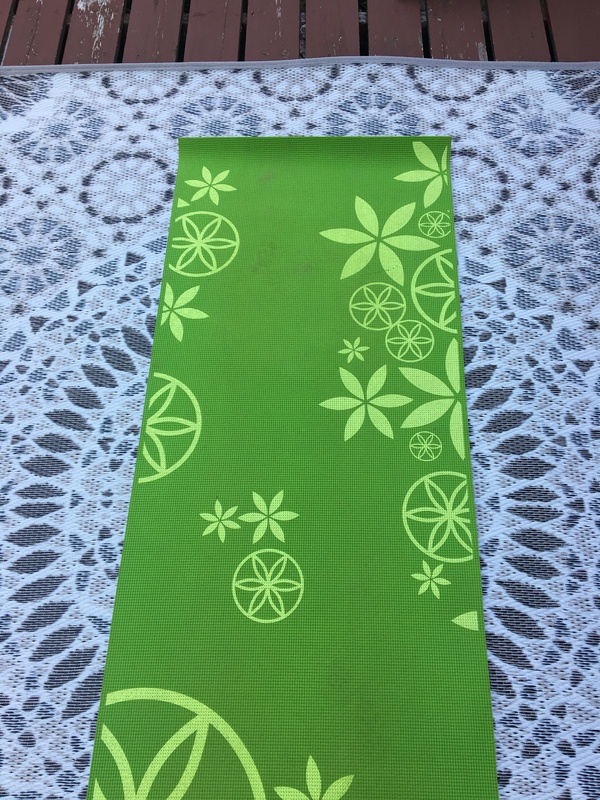 Yoga mat + deck mat = more yoga It’s mathematical! I’ve already done two outdoor yoga sessions and it had only been a few days. So, yeah, I’m my own obstacle-removing superhero this week. I don’t have a clever name yet though, and my costume will have to wait until I get back from a walk. *My province is called Newfoundland and Labrador but I live on the island portion and I can’t speak for what the weather is like in Labrador. Obstacles…. we all have ’em, and it doesn’t matter if other folks think they’re nothing, they’re ours to move past. (they have some or had them too) Good job on yours! I’ve been working on my outdoor workout obstacles too. For example, I now have a checklist of drinks, etc. and kit to put together in a soft cooler – which goes in the back of my car – for my trail runs. Seems logical, especially given my love for systems, habits, and lists….but I hadn’t done that before, as I did most of my training on treadmills, but now I have a plan that calls for outside runs. Getting myself together was a long and disorganized process with me stressing about things and doubting myself. Now, I just follow my list (today I added bug spray as I was mosquito food this morning). I didn’t know there were patio mats either! I love that you have an outdoor plan, too. I’m thrilled at the idea of a checklist for your running – I love a good checklist. I’m glad I wasn’t the only one out of the patio mat loop. Yay for you (love the yoga mat on patio mat!) and yay for us, getting this important reminder than sometimes what seem like big problems can have very manageable solutions. New shoes, new patio mat– boom! Two problems solved! Isn’t it odd how these things that feel so big and troublesome can be fixed just like that?